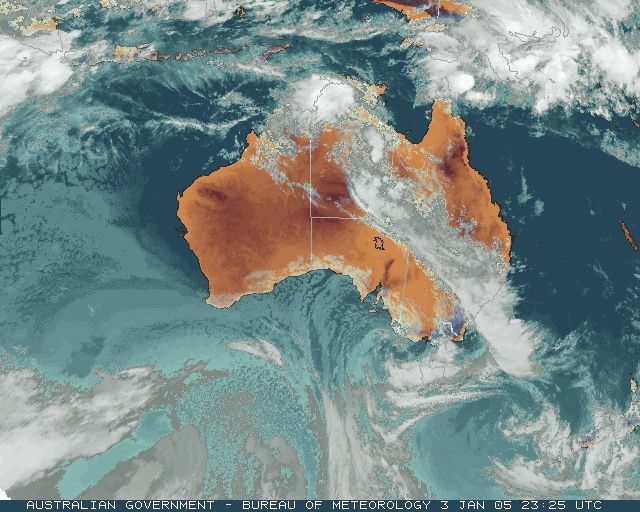 The remains of the cloudmass generated by Cyclone Raymond split in two yesterday, with one section moving SE over the southern NT and the second hovering around the northwest of the Top End. The heaviest falls were in the Daly River catchment to the south of Darwin where Mango Farm recorded 195.2mm for the 24 hours to 9am, a new January record. All except 17mm of that fell after 6pm yesterday. A flood network gauge on Mount Nancar, about 20km SE of Mango Farm, recorded 218mm in the same period. Despite the heavy rain, only isolated minor and local flooding was reported from the Daly and Adelaide River catchments because they are relatively dry at the beginning of the wet season. During the morning, the area of heavy rain moved north, brushing past Cape Fawcett on the western tip of Bathurst Island and dumping 143.0mm between 12.30 and 2.30pm. 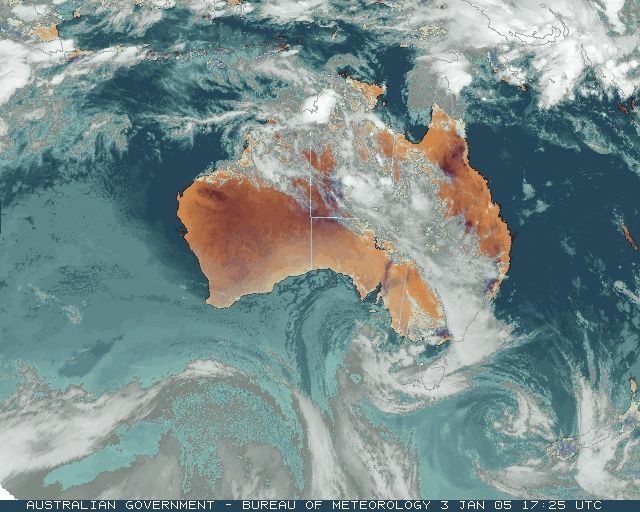 The second peak rainfall area on the rain map at right occurred to the north and northeast of Alice Springs from the southern cloudmass. 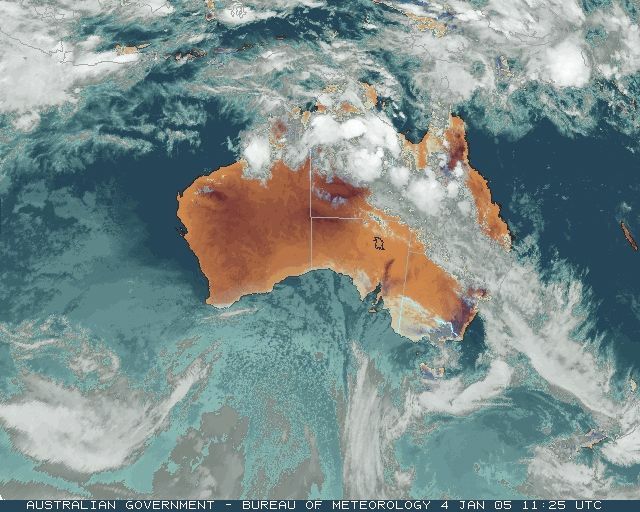 Jervois, 250km ENE of the Alice, recorded its highest January daily total in nearly 40 years with 82.0mm in the gauge at 9am, 72mm of which fell in the 6 hours before 9am. Mount Skinner, 180km north of the Alice recorded 118.6mm to 9am. The heavy rain reached across the border into the QLD Channel Country, where Boulia reported 56mm in the 6 hours to 3am in a thunderstorm. The broad area of thunderstorms that caused disruption and damage in SA yesterday moved slowly across western and central VIC overnight and this morning, bringing some heavy falls and widespread and prolonged electrical activity. The 989hPa surface low responsible for the storms moved east through Bass Strait during the day, supported by a strong upper low and a small but sharp upper trough extending northwards across VIC and into southern NSW. Strong wind shear along this trough, supported by widespread vorticity around the low, caused storms to redevelop over NE VIC around 10am and move northeast while progressively developing to the northwest along the line of the cold front shown on the 4pm surface chart. Some of these storms became severe. Thredbo Top Station recorded a wind gust of 128km/h at 1.20pm and some intense rainfall: 7.6mm in 3 minutes to 1.59pm and 9.4mm in 11 minutes shortly afterwards. Bombala AWS reported a gust of 115km/h and Point Wilson, just east of Geelong, 113km/h. See below for other strong gusts and heavy rain. In Central Western NSW during the late afternoon, a house roof was ripped off in Forbes, where SES also responded to 12 calls for damage inflicted by fallen trees. Part of the town was blacked out. At Daroobalgie, 10km NE of Forbes, a farmhouse was unroofed and a semi-trailer blown onto its side. A house was also unroofed at Bogan Gate, 35km NW of Forbes. Farther south, the Albury area received both flood and fire from the storms. Eight shops were damaged by flooding or roof leaks in Albury CBD, while a major fire was started by lightning at Goombargana Hill, 35km NW of the city. The fire burnt to within 50m of a critical communications complex on the hill that provides services to the Rural Fire Service, police, ambulance, Country Energy and Telstra. Eighty firefighters, 3 aircraft and 20 appliances fought the blaze, which began about 11.40am and burnt through 200ha before being contained late afternoon. Lightning also started two fires that burnt through 8ha in the Woolshed Valley 40km SW of Albury and just NW of Beechworth, VIC. A thunderstorm around 4pm damaged trees along the beach at Pambula Beach and brought down a large limb on a Toyota Landcruiser in the town. Lightning from the same storm struck a tree or flagpole next to the Tourist Information Centre at Merimbula, 5km north, causing $10,000 damage to IT facilities. These records are as received at 1013 EST on 05/02/2006. Help in interpreting these statistics and information on quality control is here.